Join the discussion on our forums! Come discuss Midnight Drake over in our dedicated Midnight Drake discussion topic. Still fearsome in the daytime. Been using it to some success in Paladin decks, both dragon and "buffadin." Grimy Goon buffing cards can give it extra life, which is its main weakness, and attack boosts to go with the battlecry. It helped me beat a likely Anivia Druid who spent all his early cards ramping up mana and killing the Twilight Guardian I played in the previous round. I dropped the Midnight Drake, which he ignored or could do nothing against, then followed with a Blessing of Kings buff on it. He couldn't stop an 11/8. I don't think that combo is broken enough to be scared of, in fact it feels fairly balanced. 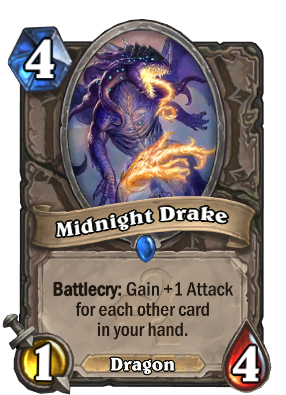 Twilight Drake is not strictly better than this card because if silenced, this guy has 4 health, Twilight Drake has 1 health. Plus that's not what strictly means. 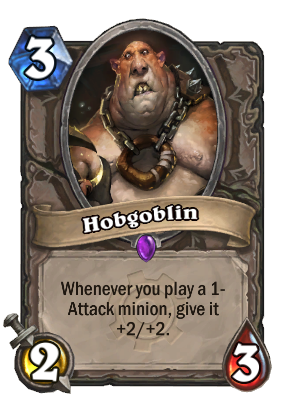 I don't see this being played in any deck type other than Handlock, and even then I the 4 health makes it very dicey. Replacing one of your Twilight Drake with this does counter Earth Shock, though. If you have 6 other cards in hand after playing it, it's a 1 mana discounted Salty Dog with dragon tagging. 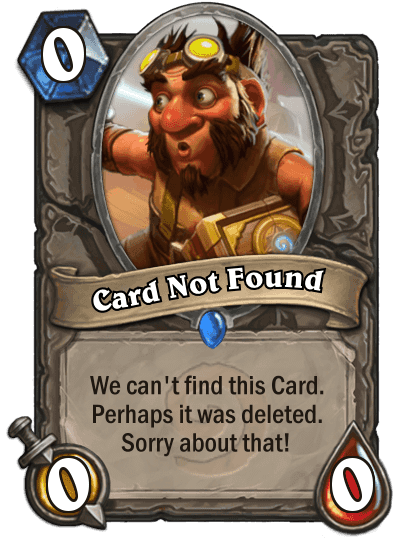 Not terrible, but 7/4 cards just rarely see play in general. Even if I consistently had 10 cards in hand I wouldn't run this. Really bad stats, but its a dragon, so it can buff some dragons effects, and increase attack of ur hand. Dont think its engough, but not so worth how it looks. so many big drops for hobgoblin on this release!